Red, stinky, dirt ears usually mean a dog ear infection is brewing and with it comes sensitivity, pain, and irritability. If your small dog has been shaking his head, rubbing his ears against objects or scratching, then he might have an ear problem. Dog ear infections are one of the most common reasons that dog owners visit their veterinarians each year. 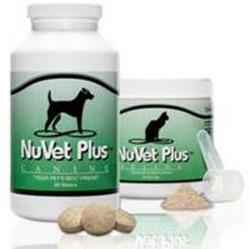 After all, who wants to see their poor dog suffer and when they have ear problems, their discomfort is very noticeable. If your dog has an infection, you might notice one or more of these symptoms. Not all of these will be present. Hearing loss, loss of balance, walking in circles all indicate that the infection moved deep into the ear. 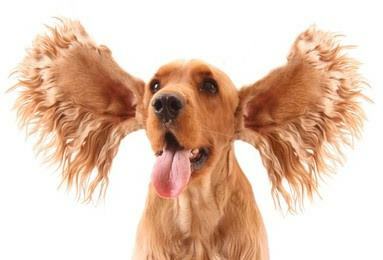 In severe cases, the dog shakes and scratches so hard that they damage their ear flap or pinna. Blood builds up under the skin causing a hematoma to form and giving the ear flap a swollen appearance. Dogs who end up with hematomas may be prone to them because of an auto-immune disease that weaken the blood vessels of the ear flap. If a dog has a problem with allergies, they may end up with an ear infection. Dogs can be allergic to many different things such as something they come in contact with, something they ingest or something they inhale. Food, grasses, pollens, molds, cleaners and other chemicals are common allergens that affect people and dog. Dogs respond to allergies, though, differently than people. Dogs with two infected ears may be allergic to something in their environment. Sometimes the veterinarian can diagnosis the allergy by treating the ear. To be thorough, the vet will need to treat the allergy and the ear. The main parasite that enjoys the environment inside the dog’s ear is the ear mite, Otodectes cynotis. If you have cats, you are probably aware that they are more frequent in our feline friends, but dogs can be affected too. Ear mites are highly contagious so if you have other dogs or cats in the household, everyone will need to be treated. If a dog becomes hypersensitive to these mites, their scratching, rubbing and shaking can be so intense that they cause trauma to the ear flap. You won't be able to see these unless you have an otoscope, but you will notice the black, coffee-ground like debris that is easily observed when you peer into the ear canal. Dogs that regularly swim can be prone to infections. Chlorine in pools can be an irritation. Dogs that swim in lakes, rivers, and oceans come in contact with germs that can live comfortably in the warm dark environment of the ear canal. Even excess bath water can get into the dog’s ear creating a warm moist environment for germs to grow. If your dog loves to run in the woods or roll in the grass, he may pick up something that sticks to the ear causing irritation. They scratch and rub and shake and before you know you have trauma, redness, and swelling. Plant awns are a big culprit and will stick to your clothes and their ear flaps. Ticks can also get into the ear and cause problems. A good grooming after a day in the forest is advisable to prevent this type of problem from turning into a full blown infection. The Dog’s Anatomy can play a part in whether or not they will suffer from ear infections. The bacteria and yeast that cause ear infections need a warm, dark, moist environment in which to thrive, grown and reproduce. Those breeds that have thick floppy ears are the most likely to have problems with ear infections. Any long haired dog whose ears hang low are candidates for ear infections. That is not to say that small erect ears never have problems, but rather these types of ears do not have the ideal environment for the germs to fester. Spaniels are well know as one breed that often has recurrent and chronic ear infections. Breeds that tend to have hair that continually grows inside the ear canal can suffer from ear infections too, if the hair and wax build up is not removed periodically. 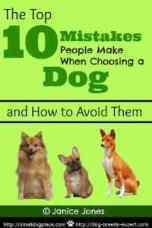 Poodles, Shih Tzu, Lhasa Apso, Maltese and other long hair dogs have this issue. 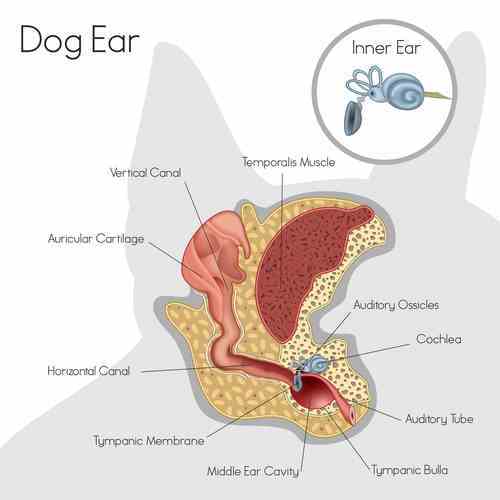 The ear canal is L shaped in dogs where it starts in a vertical position and then bends slightly as it nears the ear drum. Humans, on the other hand, have a horizontal ear canal. The shape of the dog’s ear canal is such that it is difficult to puncture the ear drum, but does make it easy for infections to become established. There are numerous types of bacteria and yeast present in ear infections. Normal healthy ears can live with hundreds of bacteria and not be affected unless something changes which causes the normal flora to go heywire. Allergies, hormonal abnormalities (deficiencies or excesses of hormones), moisture, foreign objects—anything can change these microorganisms allowing them to grow and multiply rapidly. Sometimes the dog’s natural body defenses are just overwhelmed and cannot compensate. Ear infections are the result. Dogs with yeast infections will have a brownish discharge with a noticeable odor. Yeasty ears are very itchy, but normally dog dog does not show pain. Bacterial infections can also be accompanied by a brownish discharge, but you may notice yellow to green discharge also. There is a stronger odor coming from ears when bacteria is involved. A hematoma is not a type of infection but a swelling in the dog's outer ear flap caused by blood pooling between the skin and the cartilage. They occur when dogs shake their head or scratch due to painful, itchy ears. This condition is not something you can manage at home. Most vets recommend surgery to relieve the pressure and begin the healing process. The extent of veterinary diagnoses often depends on the facilities where you take your dog and what the initial physical exam shows. If you suspect a dog ear infection, it is time to call the vet. They will begin by viewing the ear canal with their otoscope. They can determine the extent of the inflammation, if the ear drum has been affected, and if there are any foreign objects, tumors, or parasites (ear mites) present. They may also swab the inside of the ear to view under the microscope. A simple smear observed under the microscope will reveal mites and pus. If the veterinarian then fixes and stains this smear, they can determine whether there is yeast or bacteria present. They can identify the type of bacteria so that the correct antibiotic can be prescribed. Sometimes a culture and sensitivity is ordered. This is more costly and time consuming and the results may not be back for several days. This procedure is usually reserved for dogs that have chronic problems where antibiotics have not be effective. They will also ask questions to determine if allergies might be the problem or if this is a recurring problem (Chronic ear infections). If this is a chronic problem, the veterinarian will look for underlying causes such as allergies or hormonal problems. These will be taken into consideration when making the treatment plan. Antibiotics or antifungal meds to deal with the bacteria or yeast if present. Treatment is directed at dealing with the underlying problem while cleaning and healing the ear at the same time. If allergies are the cause, the allergies must be addressed. If a food allergy is suspected to be the problem, a slow change of diet may be required. If an environmental allergy is the problem, eliminating the source can help. If a super sensitivity to fleas is causing the ear problems, every flea will need to be removed. Oftentimes, however, finding the source of the allergy is a very difficult pursuit. If it is a hormonal problem, replacement therapy might be advised. Antibiotics may be injected directly into the dog or sent home in the form of pills for you to give. Antibiotic cream or drops may also be applied directly to the ear. Steroids are administered either through an injection or orally if indicated. Sometimes they are applied topically. The veterinarian may recommend an antihistamine instead of a steroid. If ear mites are the problem, a special medication is given to kill the ear mites. 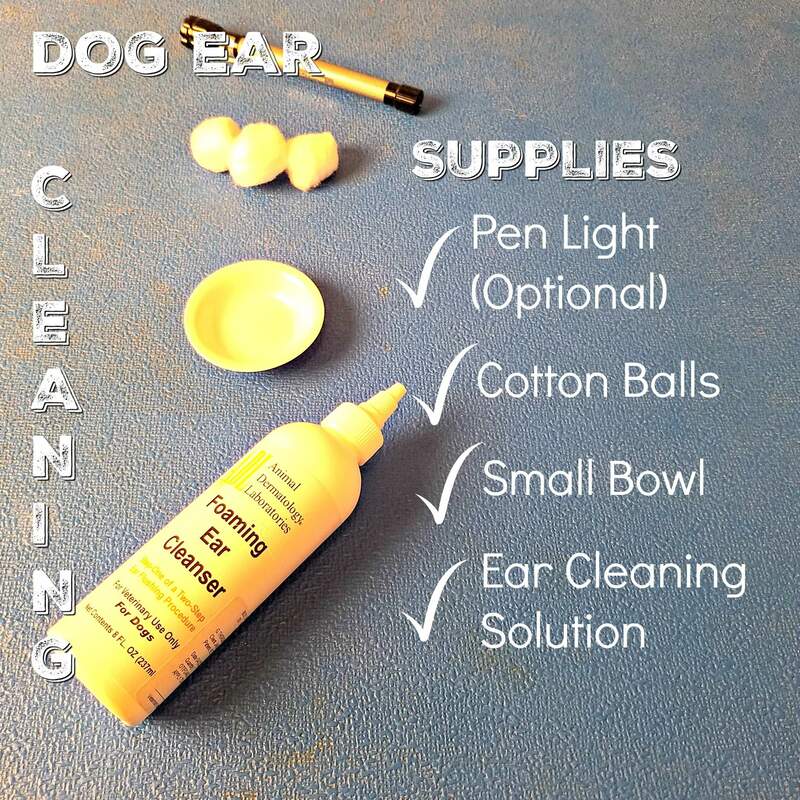 There are many good products on the market to clean dog ears. There are equally good natural solutions you can make yourself. Here are a few of my favorite over-the-counter, ear cleaning solutions. Virbac Epi-Otic Ear Cleaner – This is an excellent solution with a low pH level and alcohol free. The low pH level helps prevent the growth of bacteria and yeast and the presence of salicylic acids helps loosen hard wax buildup. Salicylic acid is not recommended if your dog has any open wounds in their ears as the product will sting causing pain to your dog. Zymox Ear Cleaner with bio-active enzymes – This is a great choice for a solution that contains only natural ingredients, cleans the ear and fights bacteria and yeast growth. Top Performance ProEar medicated dog and cat ear cleaner is good for dogs and cats that have waxy ears. It contains salicylic acid which breaks down hardened wax and eucalyptus oil which as natural antibacterial, and anti-inflammatory properties. Salicylic acid is not recommended if your dog has any open wounds in their ears as the product will sting causing pain to your dog. If you prefer something quick and easy, ear wipes work well if the ear is just full of ear wax but not infected. This is probably the easiest solution to mix up. To make a vinegar and water solution, mix equal parts of water and vinegar. Soak a cotton ball into the solution and drip or dab the solution into the ear. Allow the dog to shake, then use a dry cotton ball to remove any debris. Mix all the ingredients below into a small bottle and shake to mix. The povidone-iodine may stain. The alcohol has a drying feature so if you are worried about drying out the ear too much, use the Apple cider vinegar solution above. Soak the cotton ball in the solution and drip into the ear. Allow the dog to shake and then wipe clean with cotton balls. To remove excessive ear wax, dab a few drops of one of the oils listed above and then let the dog shake to loosen the wax. Allow enough time for the oil to spread then use a clean cotton ball to remove visible wax.